The Animas Quest is a contemporary Western embodiment of the ancient, pan-cultural vision fast is a dynamic wilderness rite for men and women seeking greater depth and clarity about life purpose and meaning. As a rite of initiation, the quest is a ceremonial descent to the underworld, in which you die to your familiar way of belonging to the world, uncover the passion and wisdom of your soul, and retrieve the gift that is yours alone to bring to the world, enhancing personal fulfillment and genuine service. The quest serves as a modern rite of initiation — not into any social, religious, or spiritual group, but into your own soul and deeper layers of true adulthood. As a rite of passage, the quest facilitates the transition through a major crossroads of life. These crossroads — leaving home, mid-life crisis, career change, loss of a loved one, divorce, a healing crisis, spiritual crisis, or retirement — can be quite disorienting and emotionally traumatic. But these unavoidable and pivotal shifts are often the necessary threshold of all post-adolescent personal development and initiation. When you neglect the human need to periodically renew yourself, your life becomes hardened, dry, brittle. The Animas Quest is an opportunity to surrender the solidness of your life so that something new might sprout in its place. It is a chance to discover (or recover) your own unique animating essence, your personal puzzle piece of the Mystery, the gift that only you can offer the world, a necessary offering toward our collective navigation of this fragile planetary time of multiple crises and immense possibilities. During your quest, familiarity and comfort are left behind. Your old way of defining yourself is abandoned. The more-than-human world and the deep imagination become your guides. Since 1980, Animas Valley Institute has been developing and enacting this modern counterpart to initiation and passage rites found throughout the world. The Animas Quest interweaves the practices of ancient traditions with the self-development tools of modern depth psychology and ecopsychology. Although we have learned much from native traditions, our programs are not imitations; they are distinctive and thoroughly modern, designed specifically for contemporary people of Western cultures. Most of our quests take place over a total of 11 days, 8 of which are spent in the wilderness. Preceding your time of solitude are five full days of preparation activities that enhance your ability to benefit from the fast. The first two and a half days of these five are held at a retreat center or car-camp before we journey to our wilderness base camp (or, on some programs, remain at our car-camp). During the five preparation days, we work with dreams, poetry, deep imagery, ceremonial drumming and dance, dialogues with nature, the way of council, and other practices to help us slip out the door of our everyday lives and access our own deeper, wilder, psychonautical currents. The heart of the quest consists of the solo: three days and nights without human companionship in nature, fasting, engaging in personal ceremonies, saying yes to the mysteries of soul, tending the true mythos of your life, praising and grieving, and birthing a vision. Upon your return to base camp, there are three days of reincorporation activities, preparing you to embody among your people what you received on your fast. The last of these three days takes place back at the retreat center or car-camp. No previous backpacking experience is required. (In fact, many of those who have quested with us have never before been camping or backpacking). However, except for the Drive-to-Basecamp Quest you must be able to carry a 45-pound pack 2 or 3 miles. THE AUGUST QUEST. . . This quest follows the traditional form of our other quests but instead of staying at a retreat center for four days, this is an all-camping quest. In addition to further extending our immersion in the wilder places, this allows for a significant reduction in costs for participants. After gathering as a group in Ridgway, CO we will drive to a remote campground at 9,400 ft for the first three nights. 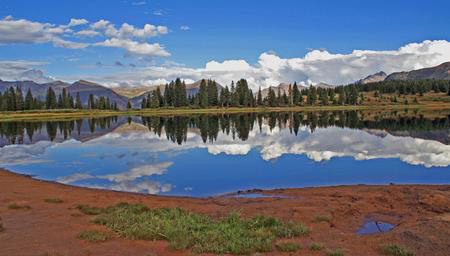 Surrounded by the high peaks of the San Juan Mountains we will ritually slip beneath the surface of our every day lives and habitual consciousness to begin our journey among open meadows, lakes, pine and aspen forests. We will then leave our vehicles and non-essential ‘baggage’ behind, backpacking on and off trail to reach our base camp at around 10, 500 ft. Here, we will further deepen into the journey, embedding ourselves in this wildly beautiful place of witnessing peaks and boulder fields, sloping meadows, snow fed creeks and, if we are lucky, a sweet spring. We will physically and psycho-spiritually position and open ourselves so that pretty much anything (and everything) might happen to us including: brilliant sunrises, warming sun, the shedding of too-tight skins, tremendous thunder storms with rain and hail, howling grief cries, wide-eyed wonder, our deepest longing, revelatory experience, dazzling stars filling the night sky…we’ll inhabit this place that is home to others such as elk and mule deer, marmot, pika, coyote and bear. NOTE: This quest is more physically demanding than our other quests due to terrain and altitude. We encourage those coming from lower altitudes to arrive a day or two early to begin acclimatizing. Participants will need the physical strength and endurance to carry a 40-50 lb pack for up to 2-3 hours, gaining 1000-1300 ft in 1.5 miles at altitude. Please physically prepare yourself in the weeks and months before the quest. We’d ask you to be realistic about your physical capacity. If you have any questions or concerns, please get in touch with Mary or Rebecca by contacting the Animas office at soulcraft@animas.org. Rebecca is a wild-hearted wanderer and soul guide who supports people to open to their depths and to flower in relationship to the wild Earth. The prayer she lives is to love and embody the Mystery and the Wild as they sing each being alive, evoking their truth and beauty. 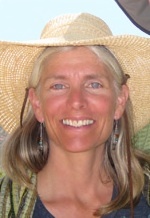 Rebecca has worked as a therapist and wilderness guide since 1997, and has trained as a guide with AVI since 2002. As an Interdisciplinary Yoga Teacher and a student of Hakomi experiential therapy, Rebecca brings a body-centered approach to guiding. She received her Masters Degree in Counseling from Johns Hopkins University in 1997.